Many major appliances are made of enamel-coated sheet steel which, in the middle 20th century, was usually white. The term white goods in contrast to brown goods, is also used, primarily where British English is spoken, although definitions for the term "white goods" can differ. Many appliances nowadays would be considered brown goods, some being connected to the Internet. 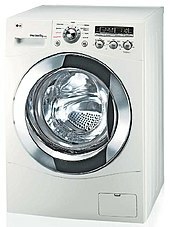 In the United States, the term white goods can also refer to linens. In New Zealand "whiteware" may be used, elsewhere a term from pottery. Since major appliances in a home consume a significant amount of energy, they have become the objectives of programs to improve their energy efficiency in many countries. Energy efficiency improvements may require changes in construction of the appliances, or improved control systems. In the early days of electrification, many major consumer appliances were made by the same companies that made the generation and distribution equipment. 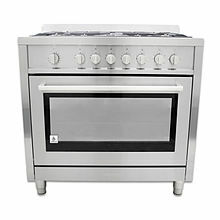 While some of these brand names persist to the present day, even if only as licensed use of old popular brand names, today many major appliances are manufactured by companies or divisions of companies that specialize particular appliances. ^ "AAA Appliance". Aaa-applianceinc.com. Retrieved 4 October 2016. Wikimedia Commons has media related to Major appliances.